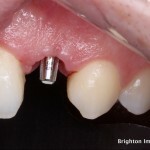 What Difference Would A Single Tooth Implant Make? 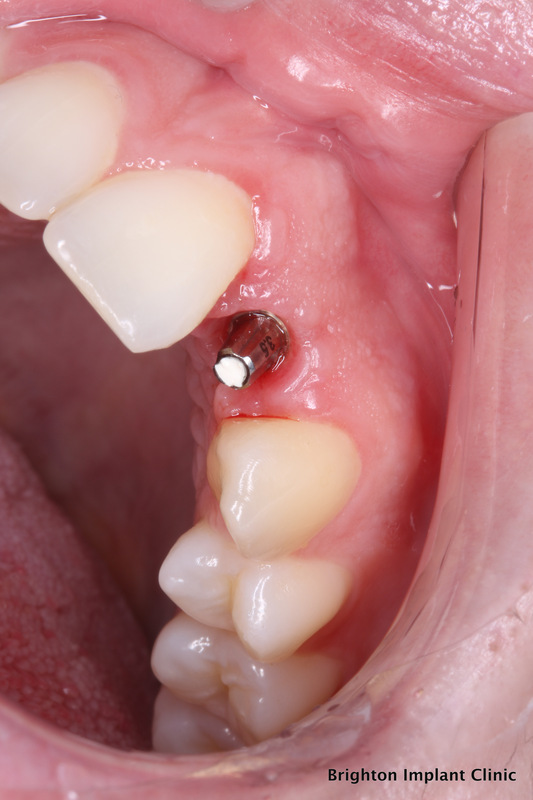 Dental implants can replace missing teeth for both functional and aesthetic reasons. 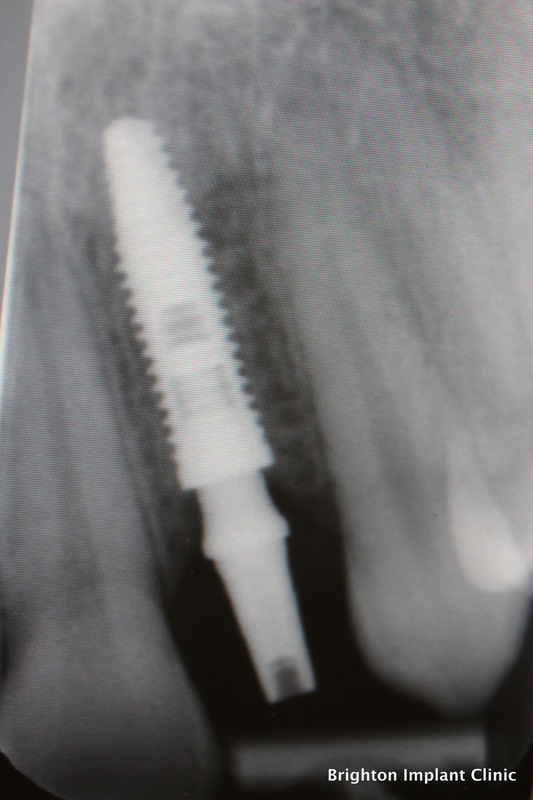 Dental implants are small titanium screws which when placed into the human jaw bone can act like a 'tooth root' which is able to support a single tooth crown or bridge. 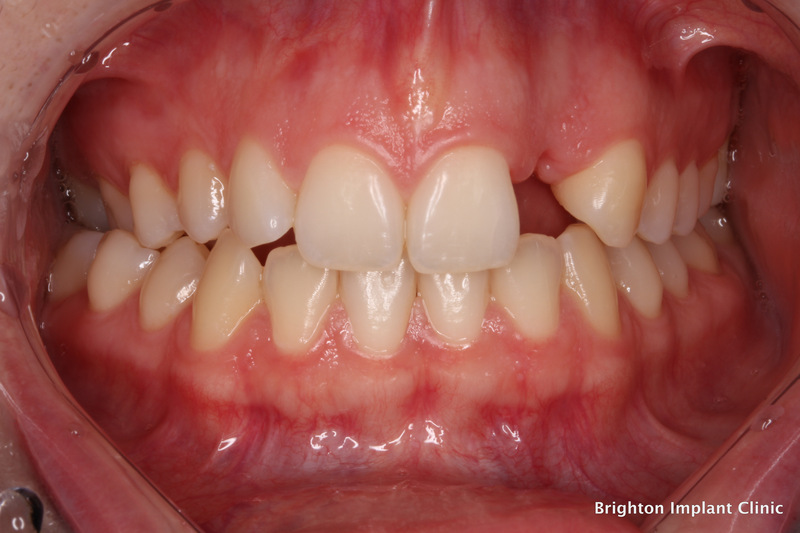 Up until a few years ago the only solution for missing teeth was removable dentures and fixed bridges. They are usually made of acrylic and can be used to replace a single tooth, a few teeth or a whole arch of teeth. Dentures are not fixed to the teeth or mouth, hence they can move during function and speach. Dentures do not help to preserve bone tissue. 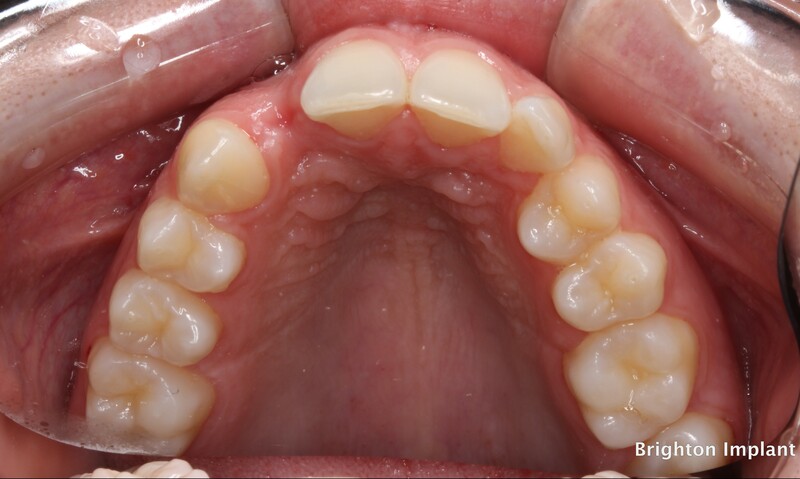 With tooth loss the bone that supports teeth loses the normal stimulus from natural teeth. Bone tissue will resorb or shrink with the absence of teeth. Dentures to not provide any stimulus to the bone tissue hence patients who have dentures will continue to lose bone tissue. Dentures affect the taste sensation. 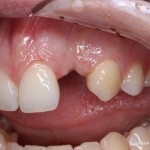 With upper dentures the palate is covered by a denture for retention. The palatal coverage helps keep the denture in place. There are taste buds in this area and as the denture covers this area it affects the ability to taste food properly. Dentures can be uncomfortable. 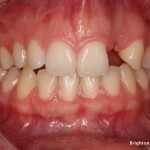 As a denture is a removable appliance it can cause sore spots and redness/inflammation of the underlying gum tissues. When pressure is applied to the denture during normal chewing it can lead to uncomfortable areas under the denture. 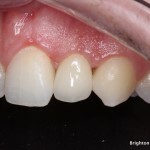 Dentures on a positive side are less costly when compared to dental implants or fixed bridges. A denture can replace multiple teeth in one solution. 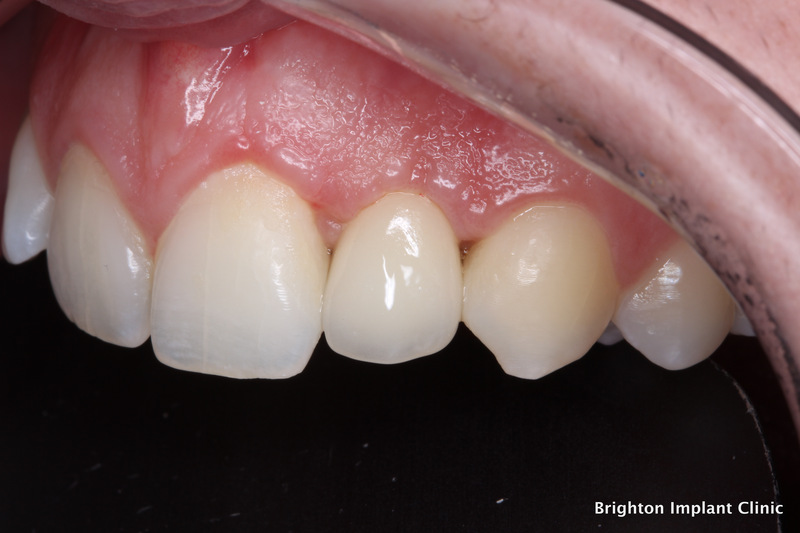 Dentures can replace lost bone and gum tissues from an aesthetic point of view. If there has been marked bone loss then a denture can replace missing gum tissues and restore the facial profile and lips to a normal appearance. 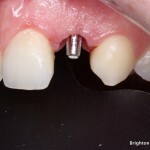 Dental implants are growing in popularity as they are predictable and safe alternatives to dental bridges and dentures. 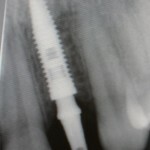 A dental implant is usually placed under local anesthetic but it can be placed under sedation as well if patients are anxious about dental treatment. 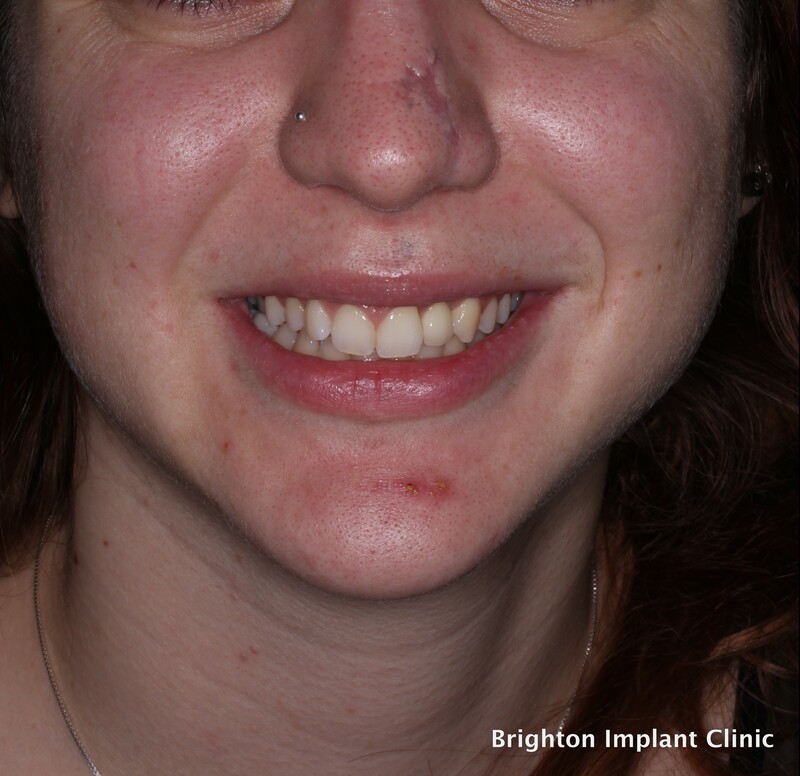 What difference a single tooth implant can make! Provide fixed teeth. 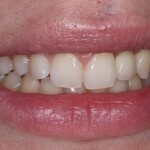 This is the most similar solution to natural fixed teeth that is available today. 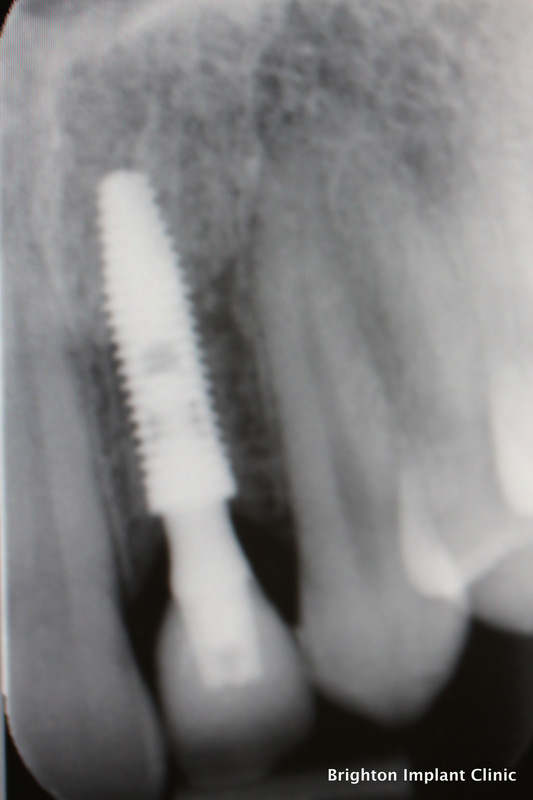 Dental implants are placed into the jaw bone and act like a tooth root. 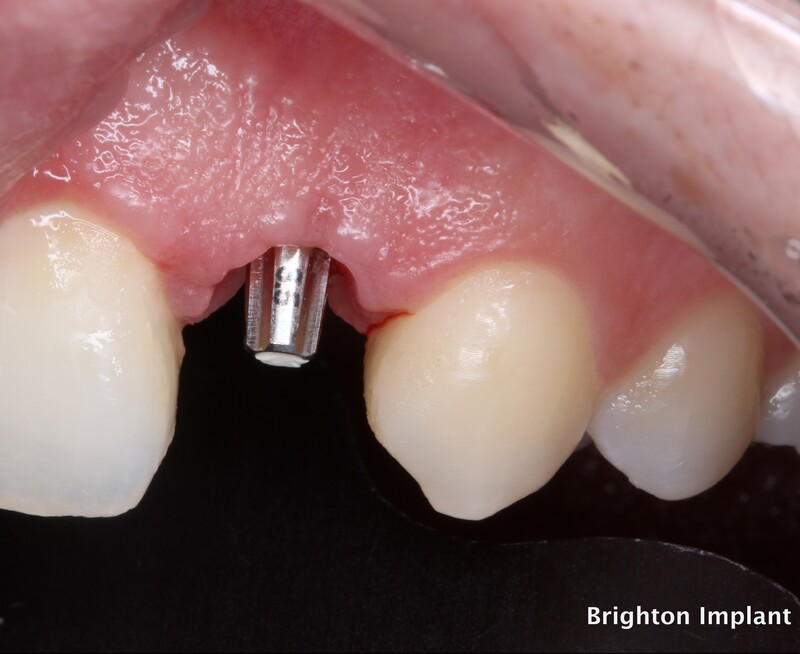 A dental implant can support a single tooth crown or be part of a number of dental implants that support a dental implant bridge. 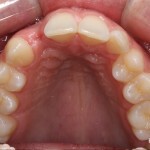 In more complex cases 4 dental implants can support a complete full arch of teeth. 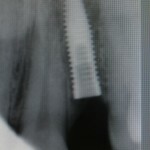 See all on 4 dental implants for more information. Dental implants provide a stimulus for the jaw bone, hence bone tissue does not shrink or resorb like we see with removable dentures. 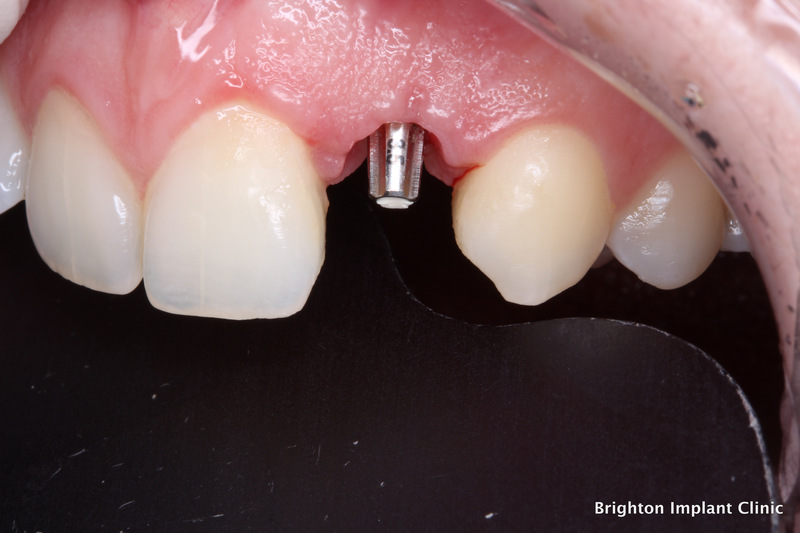 Dental implants that support crowns or bridges are comfortable and highly aesthetic. 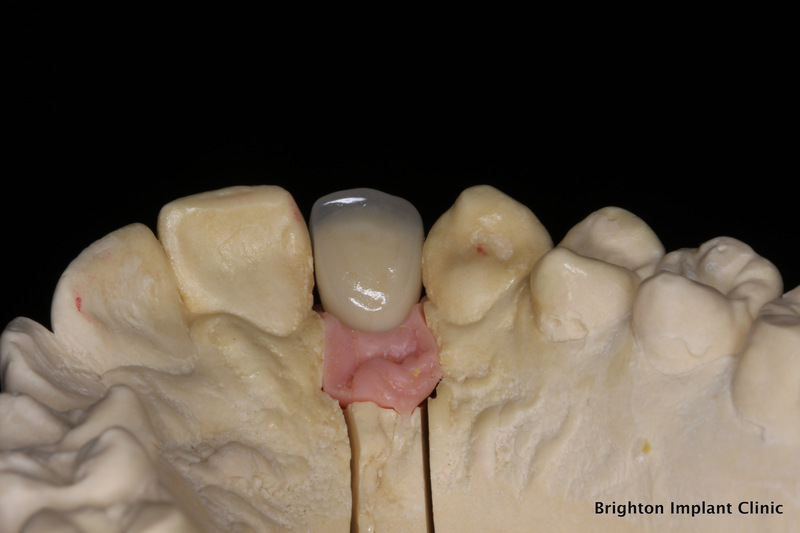 Newer generations of porcelain like Emax and zirconia are improving the appearance of dental implant restorations even further. 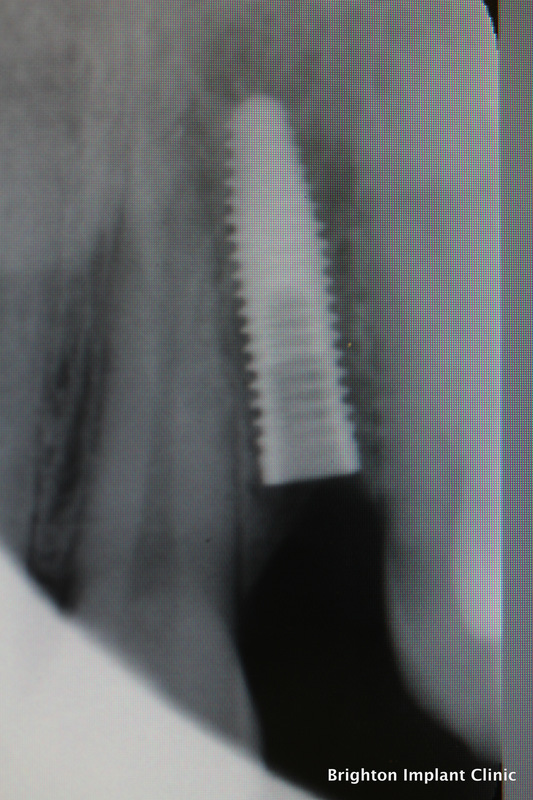 A Clinical Case Of A Single Tooth Dental Implant. 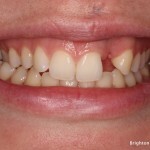 A young lady came to see us as she was unhappy with her removable partial denture. 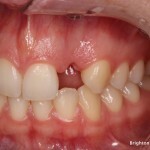 She broke her upper left lateral incisor in an accident while she was on holiday. 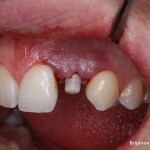 She had to have the tooth removed and was provided with a removable denture. 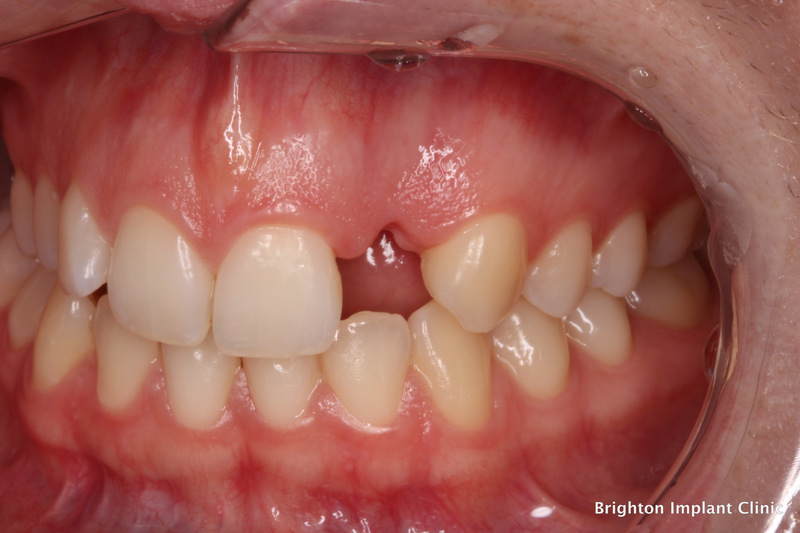 The patient came to see us 2 years after losing her tooth as she was unable to cope with her denture. 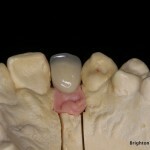 A thorough implant assessment was completed , photos and impressions for study models were made. 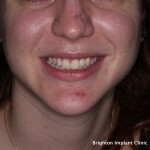 The patient had a high smile line (showing gums while smiling). 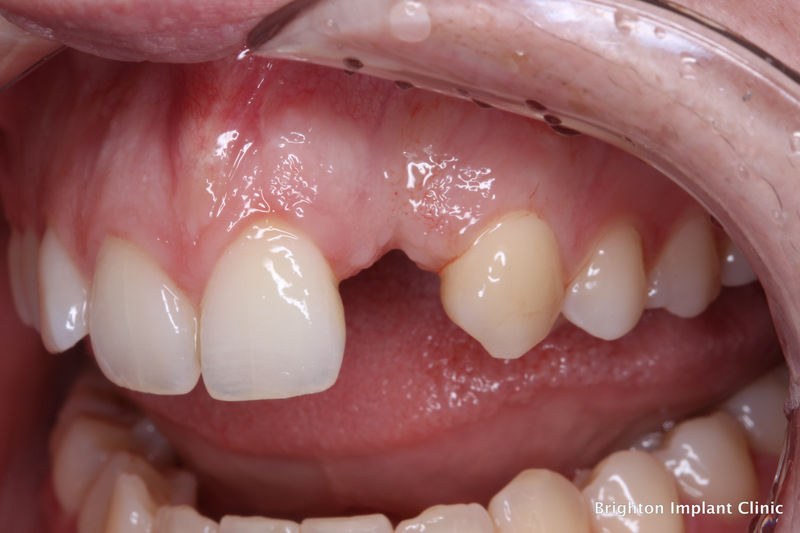 This made the case more challenging as we had to handle gum tissue carefully during surgical and restorative procedures to prevent unwanted and unsightly recession of gum tissues. A CT scan was used to assess the bone volume available for implant treatment. 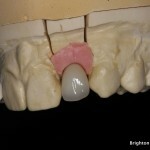 A mock up of the missing tooth was done to assess the possible outcome. 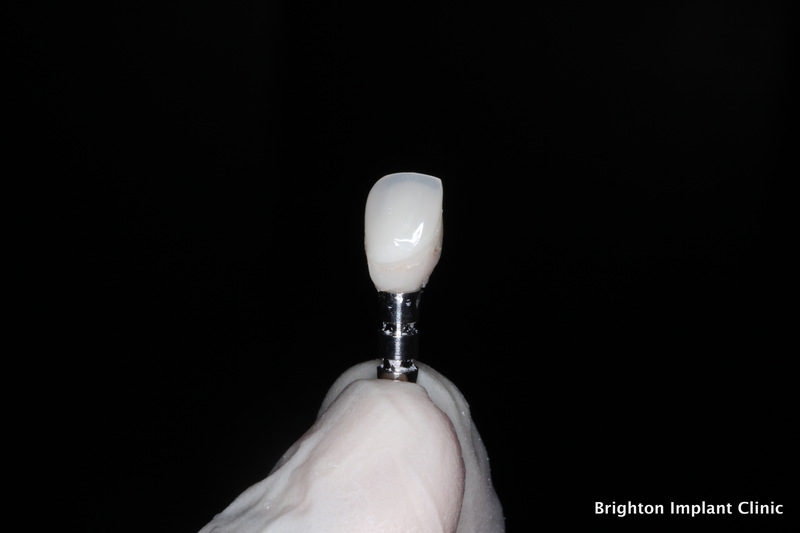 This mock up was done to using an acrylic tooth which was chosen and then contoured to match patient’s tooth shade and shape. 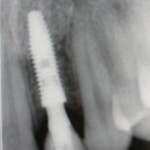 After agreeing the treatment plan with patient, the implant was placed under local anesthetic and was allowed to heal buried below gum tissues for four months. 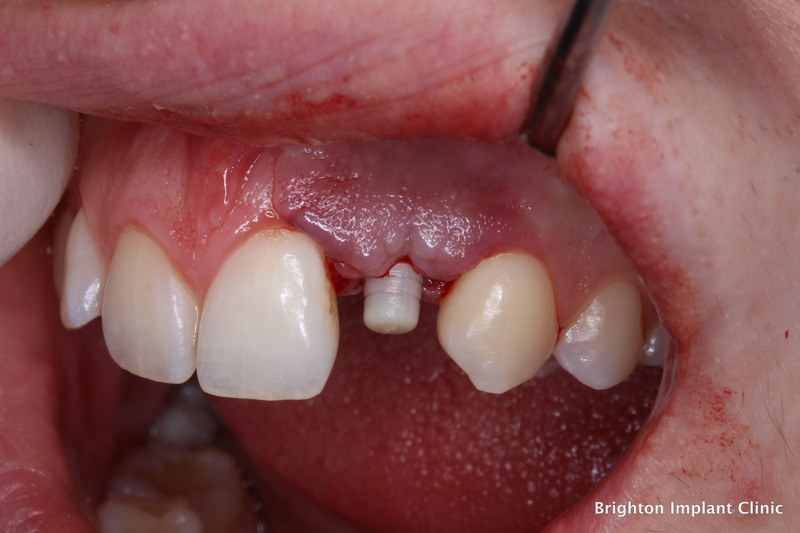 During this time the patient continued to use her removable denture. 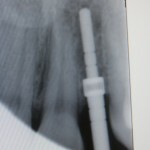 After allowing four months for the implant to integrate with bone, it was uncovered under local anesthetic. 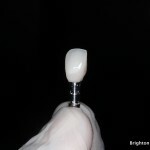 The chosen acrylic tooth was used to make a provisional crown. The gum tissues were allowed to heal around the temporary crown for 4 weeks. During this time, the gum tissues become adapted to the contour around the temporary crown ( which is similar to a natural tooth) . 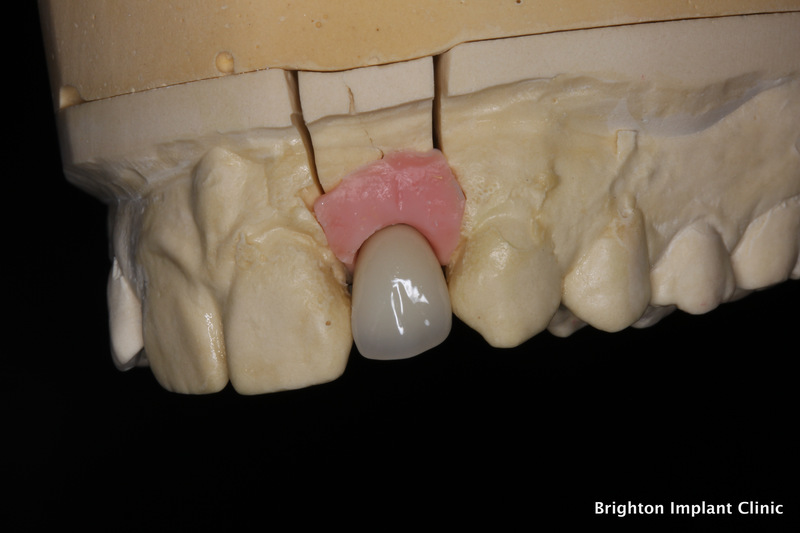 This stage is very important when restoring dental implants in the anterior aesthetic zone. 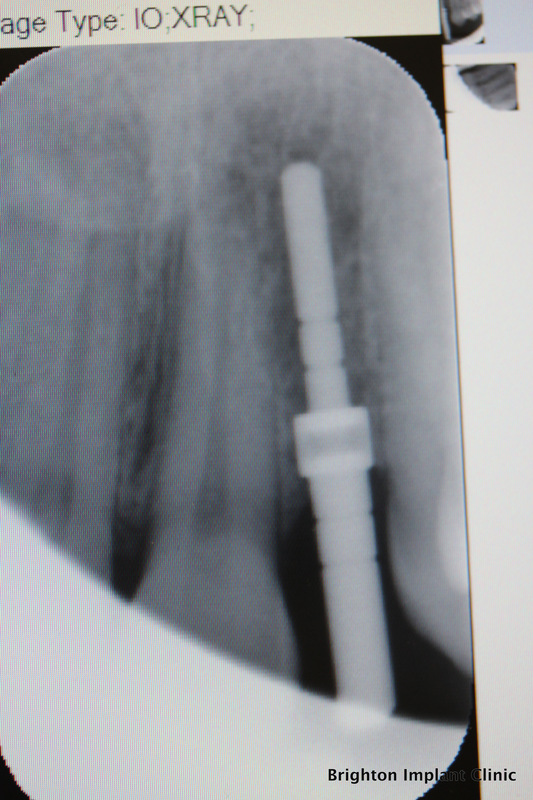 A titanium universal post was used as an abutment. 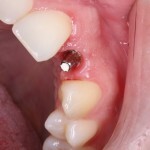 A metal free crown was then fitted as the definitive implant crown. Gum tissues healed well and appear pink and healthy. The gums tissues around implant crown will continue contouring over the next few months provided good oral hygiene procedures are followed. 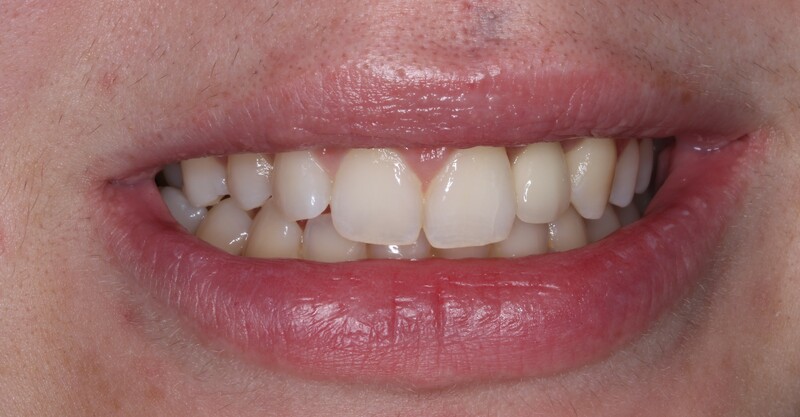 The patient was very pleased with the results of the treatment that we provided. A special thanks to Dr Uma Nallathambi for sharing this case with us. 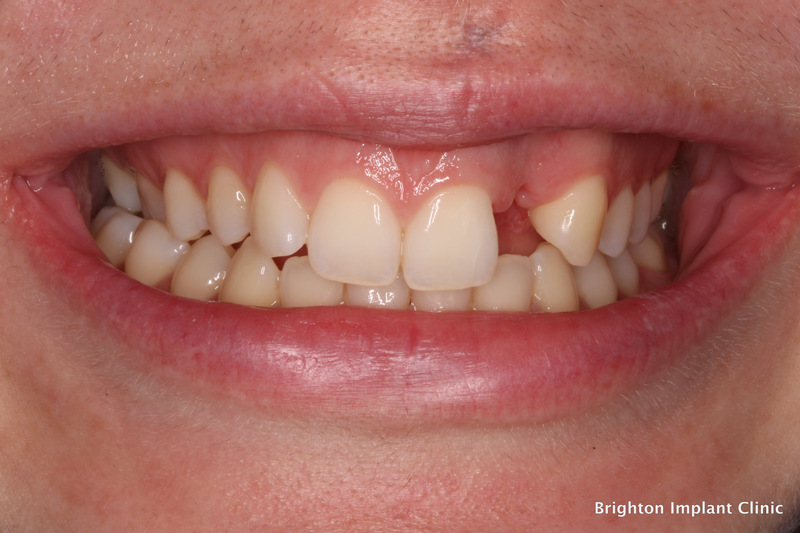 A big thanks also to our expert dental technicians at Brighton Dental Lab.